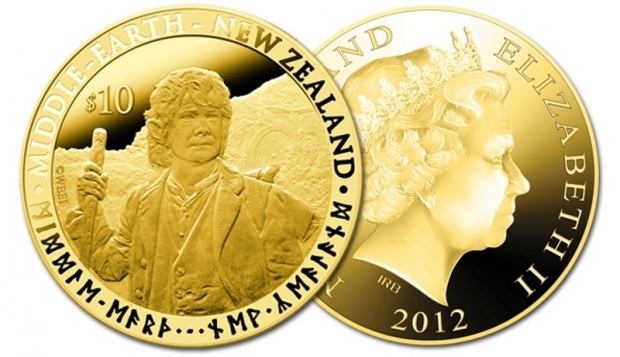 (MoneyWatch) With its economy struggling, New Zealand hopes to cash in on "The Hobbit" by turning it into actual cash. The nation is releasing special commemorative coins depicting characters from J.R.R. Tolkien's beloved book. The coin release coincides with the premiere of the first installment in Peter Jackson's film adaptationof the book. It is also part of a publicity campaign aimed to rebrand the country "100 percent Middle Earth." Jackson's three "Lord of the Rings" movies gave a huge boost to New Zealand's tourist industry. In a 2004 survey, 7 percent of visitors cited the films as a major reason for their trip, according to Tourism New Zealand. Tourism is the nation's second-largest industry, after dairy products, and has seen a 10-percent drop since 2008. The coins, depicting Bilbo Baggins, Gandalf and other characters, are legal tender, but they are aimed at collectors. The cost of the coins will be more than their face value, the New Zealand Post reports. The most expensive coin is made of pure gold and will cost around $3,000. The cheapest will cost around $25. Special commemorative stamps will also go on sale, presumably at lower prices. Wellington, the nation's capital, will temporarily change its official name to "The Middle of Middle Earth" for the three weeks before the world premiere in New Zealand on Nov. 28. But the three-part film version of "The Hobbit" will be hard-pressed to boost New Zealand's economy as much as the first "Lord of the Rings" series did. They were released between 2001 and 2003, a time when economies around the world were doing far better than they are now. Since then, the value of New Zealand's currency has doubled, hurting exports and making it more expensive for tourists. Some 15 percent of the offices in Wellington's business district are empty. Christchurch, the nation's third-biggest city, is still rebuilding from two major earthquakes. Ameliorating such problems is a lot to ask, even with magic ring.